the 40h kit allows users to assemble their own 40h-compatible device. the kit includes the circuits and keypads, requiring the use to create an enclosure and top plate. we produced 100 units of each kit in june of 2007. they sold out in september. we’ll begin taking orders and shipping a new batch on november 30th at 1pm EST. The 40h kit: your best bet if you fancy assembling your own Monome and your own case rather than unboxing a pre-assembled unit of this unique controller. And in other news, the fully-assembled Monome One Twenty Eight is due December 14, just in time for holiday shopping. (Trust me, getting your order in then is probably more fun then going to Kohl’s for Black Friday deals at 4AM Friday must have been. Don’t ask, foreign readers — it’s an American thing.) The more affordable Sixty Four is coming in January. If you’ve got a Monome kit creation of your own, we’d love to see it. 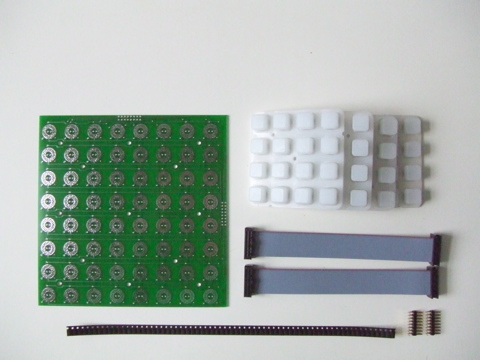 And yes, look for my own Monome kit creation by the beginning of January.